The Nintendo Labo is an awesome new toy building platform and is due to be released in April 2018. We've put together this page to help you easily compare prices (everyone want's the cheapest Nintendo Labo price!) and stock levels as - knowning Nintendo - this thing is going to be hard to find. 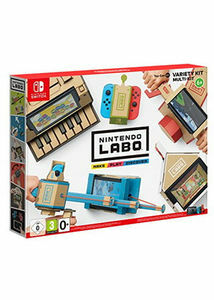 Smyths Toys Nintendo Labo Toy-Con 01: Variety Kit & FREE Gift! Smyths Toys Nintendo Labo Toy-Con 02: Robot Kit & FREE Gift! Nice one Kelsey Worth noting Smyths Toys are offering £5 off the Variety Kit and Robot Kit if you pre-order now for in-store collection. Offer valid while stocks last. Discount applied in basket.